Miracle Fruit, also known as Miracle Berry, is a rare fruiting evergreen tree native to tropical West Africa. Miracle Fruit is famously known for its bright red berry that causes sour foods to taste sweet! When eaten before something sour, a lemon for example, a component in the Miracle Berry called Miraculin will cause the lemon's sourness to disappear! This effect can last up to 30 minutes. For the best effect, when eating the berry first let the smooth flesh roll around your mouth and fully cover your taste buds for up to 2 minutes before swallowing. The leaves are long, smooth and deep green. 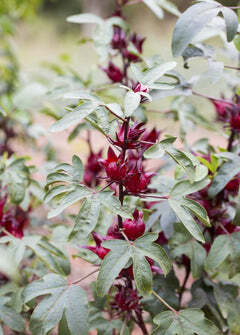 It grows like a shrub, averaging around 5 to 7 ft. It will produce small white flowers and bear fruit intermittently throughout the year. Miracle Fruit is an excellent potted plant as well and will grow wonderfully planted indoors in a container for many years. Try to simulate it's native tropical climate when planting or overwintering indoors by misting the leaves and providing bright natural sunlight. The roots like moisture but do not like to be water logged, so make sure to avoid over watering. Harvest Season: Miracle Fruit will bear fruit year-round once established. Soil & Moisture: Rich, nutrient dense, acidic soil. They thrive in wet, warm, humid, tropical conditions. Do not dry out. Climate Zones: USDA plant hardiness Zones 9-11. Miracle Fruit trees are not frost tolerant but can survive outdoors in zone 9 with protection until well-established.